Can you guess which state has ten totally unique minerals, and one of its most popular attractions is the crater of diamonds state park, where you can hunt for diamonds and keep what you find? learn fun and interesting facts about the United States by playing game of the States. A family favorite for decades, this newly updated version contains useful and educational STEM (science, technology, engineering and math) facts about each state. As state cards come into play, players read the STEM facts on the cards they draw. This is a great way for all players to gain additional knowledge about the States. Players can even use the state cards without the game board to play simple trivia games like guess the state capital. players will become familiar with the fifty States, their locations, capital cities, top products and more! 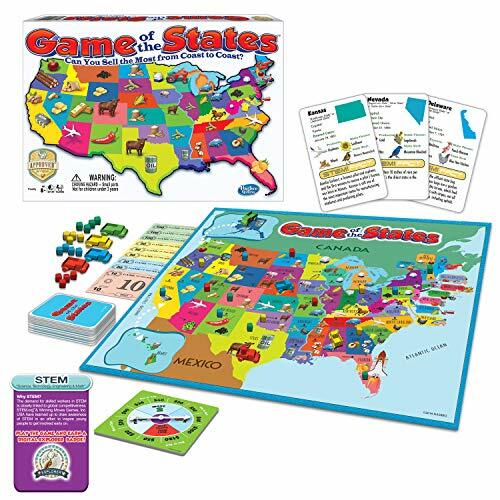 the game of the States challenges you to travel back and forth across the country, buying products in some States and selling them in other States. The winner is the player with the most money at the end of the game. Recommended for ages 8+, 2-4 players. The challenge: game of the States challenges players to race their trucks back and forth across the country - buying products in some States and selling them in other States. Updated version: contains fun and educational STEM facts about each state. Can you guess which state is considered the southernmost Northern state, and the northernmost Southern state? Draw your state card: as each state card is drawn, player reads aloud the STEM fact at the bottom of the card. A fun way to learn these interesting nuggets of information about each state! Sell the most from Coast to Coast: game continues until all packages are removed from the board. Player with the most money wins. We even include a simplified Junior version aimed at 6-7 year olds! View More In Cards & Equipment. If you have any questions about this product by Winning Moves Games, contact us by completing and submitting the form below. If you are looking for a specif part number, please include it with your message.